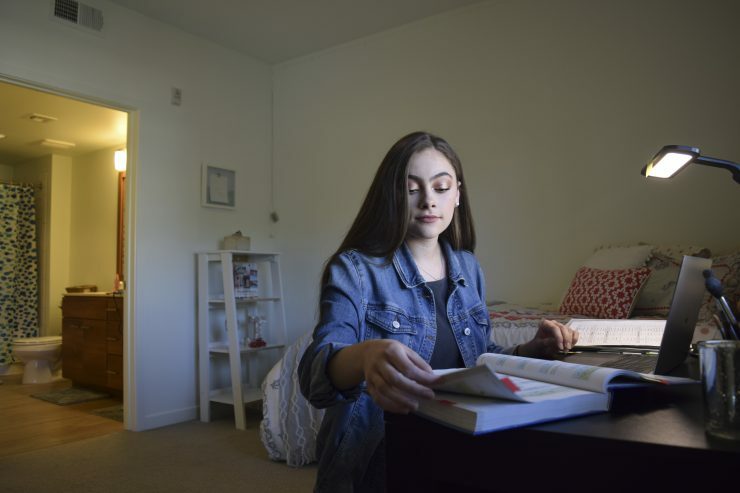 In a stylish apartment lined with windows that offer nighttime views of Angel Stadium’s firework displays, roommates Jessica Amato and Olivia Medina describe life in their new Chapman University student residence. Homework at the kitchen table. A weekly “family dinner” with friends – enchiladas last week, by the way. Laundry easily done during study breaks, thanks to the washer and dryer provided in the unit. And while the full-sized oven may not be the biggest perk, it’s appreciated by the sophomore business majors. “We make cookies a lot,” says Amato ’21. Welcome to the latest university housing available to Chapman students. 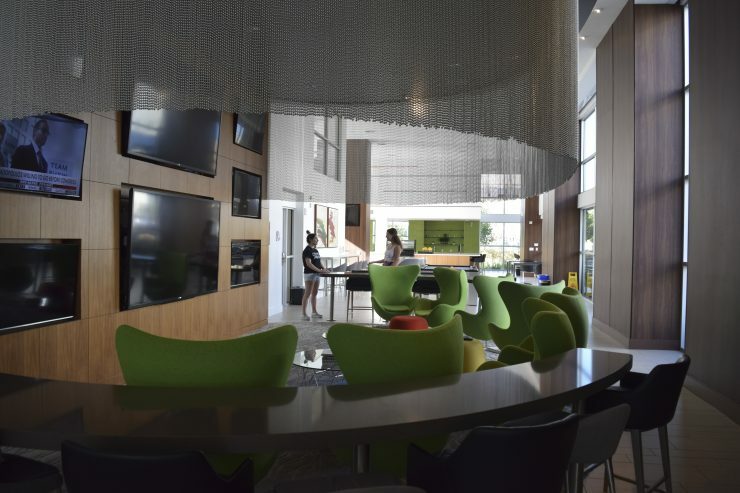 The Chapman Grand apartments in Anaheim’s Platinum Triangle opened to students this fall, after being purchased and retrofitted by the university as part of its plan to offer more student housing options. And just as students settle into those apartments, the wood framing for a unique residence at the corner of Palm Avenue and Cypress Street in Old Towne Orange is rising from its foundation. The Villa Park Orchards residential village will house about 400 students in an apartment-style residence hall designed to blend with the historic industrial character of the area. 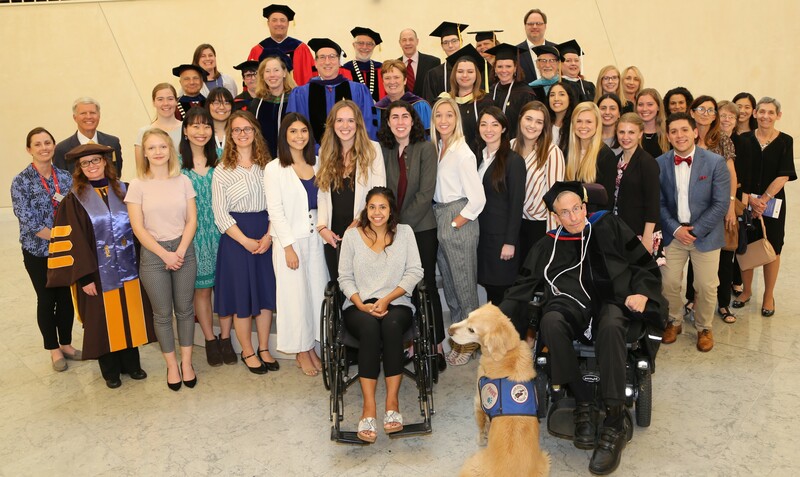 The projects represent Chapman’s efforts to offer excellent student housing and heed community concerns about student rentals in the neighborhoods surrounding campus. Students are happy with the trend, too. Residential advisors live on site at Chapman Grand, which can accommodate about 900 students and in its first semester already has an occupancy of 723. But students still enjoy a more independent lifestyle in this residence hall – which isn’t available to first-year students. “I really like being able to cook for myself. That’s a major, major plus. I feel like I’m just more independent in general. I go to the grocery store, I do my laundry at the same time I’m doing other things because it’s right here,” says Medina ’21. Chapman Grand amenities also include a gym equipped with a climbing wall and a pool and courtyard area decked out with grills, a hot tub and cabanas. Regular shuttle service to and from the Orange campus is provided and year-round lease options are available so students can stay in the area for jobs and internships during summer breaks. Similarly, the Villa Park Orchards residential village will also offer a measure of independent living for students in suite-like apartments that include kitchenettes, living rooms and multiple bathrooms. 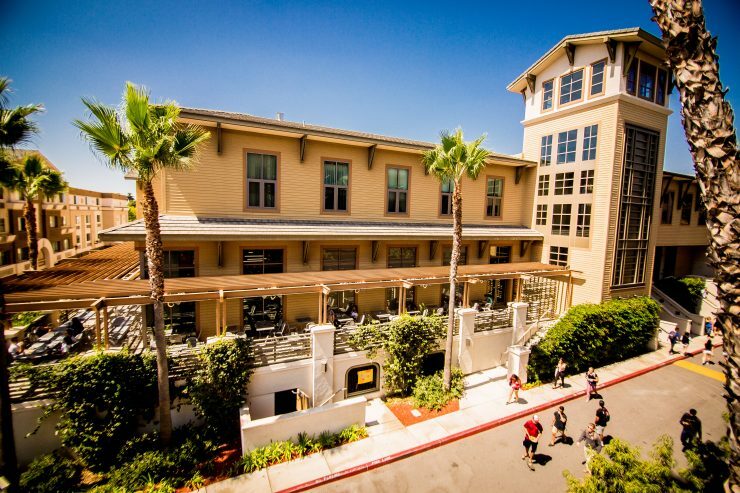 The new residence hall sits in the midst of a growing campus hub between Crean Hall, which serves the Crean College of Health and Behavioral Sciences, and the Dodge College of Film and Media Arts. 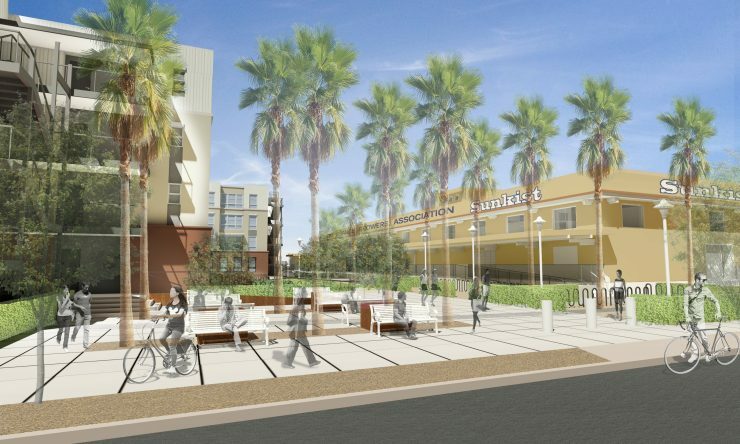 When it opens in fall 2019, the new Villa Park Orchards residential village will be part of a hub of historic buildings revitalized by Chapman University for educational uses. Eventually, a new facility for the Department of Dance will take shape just steps away in another project that resonates with local history. “Of particular interest for this project is that it incorporates the architectural heritage of the historic site it shares with the 100-year-old Villa Park Orchards citrus packing house,” said Kris Eric Olsen, vice president of campus planning and operations. Meanwhile, amenities at the University’s existing on-campus housing located at the north side of campus continue to receive upgrades. Most recent was the refurbishment of the climbing wall at the Sandhu Residence and Conference Center. In addition, the Randall Dining Commons won an award from the National Association of College and University Food Services for excellence in culinary innovation, menus, presentation and event planning. Expanded outdoor seating was among the recent renovations at the Randall Dining Commons. 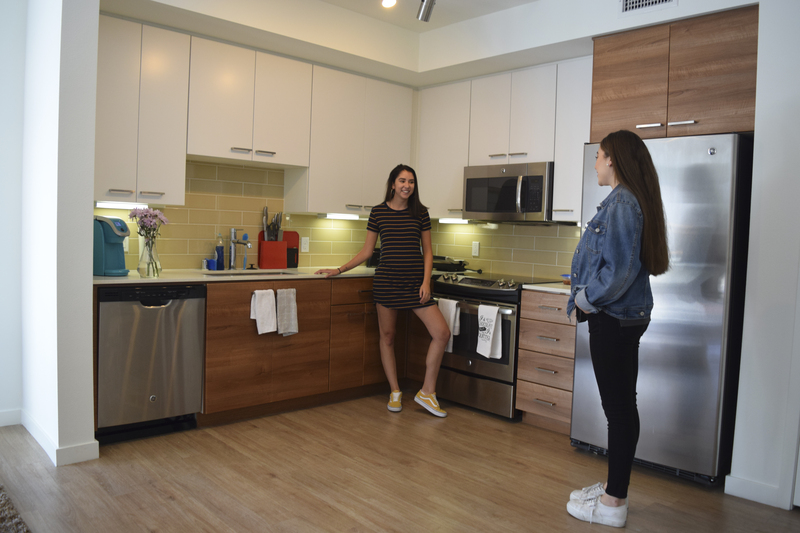 Back at Chapman Grand, Medina stands in the kitchen equipped with stainless steel appliances, quartz countertops and sleek frameless cabinetry and jokes that the housing upgrades could almost make it hard to graduate and move on. “My parents told me that this is the nicest apartment I’m ever going to live in,” she says with a laugh.